The Washington Nationals face yet another major contract decision this season. Star third baseman Anthony Rendon is in the final year of his contract, and if Tuesday’s news is any indication, he’s willing to try and work something out with the team. Rendon and the club reportedly met Tuesday to discuss an extension, according to Mark Zuckerman of MASN. While Zuckerman didn’t provide specific details on the meeting, he said it was an encouraging sign for both sides. 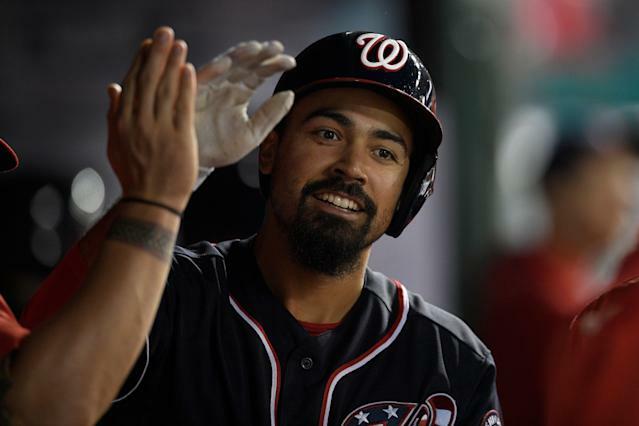 The end result of the meeting isn’t clear yet, but the fact it happened underscores the continued desire of both sides to continue talks in the hopes of consummating a deal that would keep Rendon in Washington long-term and prevent him from becoming a free agent at season’s end. Many players prefer to limit contract discussions to the offseason in an effort to minimize distractions in the middle of the year. Rendon’s willingness to talk with the team during his final year is a positive development. Rendon and the Nationals last met during spring training, but were reportedly “far apart” during those negotiations. The 28-year-old Rendon may have had more leverage this time around. He’s gotten off to a blistering start in 2019, hitting .400/.460/.873 over 63 plate appearances. While Rendon doesn’t get as much publicity as other elite third baseman, he compares pretty favorably to Colorado Rockies star Nolan Arenado. Since 2016, Rendon has a higher fWAR than Arenado. Only one third baseman — José Ramīrez — has been better than Rendon over that stretch. That should bode well for Rendon considering Arenado just signed an eight-year, $260 million deal to stay in Colorado. Rendon is a year older than Arenado, but will likely be looking for a similar deal. Whether the Nats can keep Rendon might depend on his willingness to accept deferred money. The Nationals have been willing to spend money in recent years, signing Max Scherzer and Patrick Corbin, and extending Stephen Strasburg. The team even made a serious run at bringing Bryce Harper back before the Philadelphia Phillies offered him more years and money. In all those cases, however, the Nationals deferred significant chunks of money in those deals. Harper’s contract was rumored to have deferrals through 2072. Those deferrals may have contributed to Harper declining the team’s offer. Based on that, it seems likely the team’s offer to Rendon will feature deferred money. If he’s OK with that, it’s possible the two sides will agree on a deal before Rendon hits the market. It worked for the Nationals with Strasburg. If not, then Rendon will take his chances in free agency. While the market hasn’t been kind to most free agents the past two winters, Rendon is one of the few elite options who could still fetch a mega deal. After last offseason, the Nationals might be more motivated than ever to work something out now. The last time they let a star hit the market, he signed with one of the team’s biggest rivals. The Nationals are now tasked with making sure Rendon doesn’t follow a similar path.